Simplify the process of hitting your daily quota by following this one rule: eat the rainbow. You know the point in every psychological thriller where the hero has become obsessed and is going completely off the rails? We see montages of them frantically putting together a collage on their apartment wall, connecting clues with pins, strings and markers (think Carrie Mathison on “Homeland”). That’s how I imagined myself when I first read through the section of the Dietary Guidelines that covered vegetable intake. Don’t forget, all of this has to be accomplished within calorie limits while also managing adequate amounts of protein. Plus, I’ve never been very good at eating many vegetables. Let me backtrack a bit. Before I began my year-long project to adhere to the federal Physical Activity Guidelines and Dietary Guidelines, which I undertook with the support of the Science & Research Team of the American Council on Exercise, I was eating less than 1 cup of vegetables each day. In addition, I had narrowed my vegetable intake based not only on my own pickiness, but also on the tastes of my even pickier teenage son. If my wife and I didn’t make ourselves a salad with dinner (which we did every once in a while during a brief bid to eat healthier), we were pretty much limited to broccoli in a stir-fry dinner or baked potatoes as a side dish. That was a year ago, and a lot has changed. Now, after a year of working toward eating a rainbow of produce, I’m successfully balancing my calorie limit, macronutrient needs and sodium intake with a diet that includes a wide variety of vegetables. Before I tell you how I made the needed modifications to my eating plan, let’s review why eating different color veggies is so important. 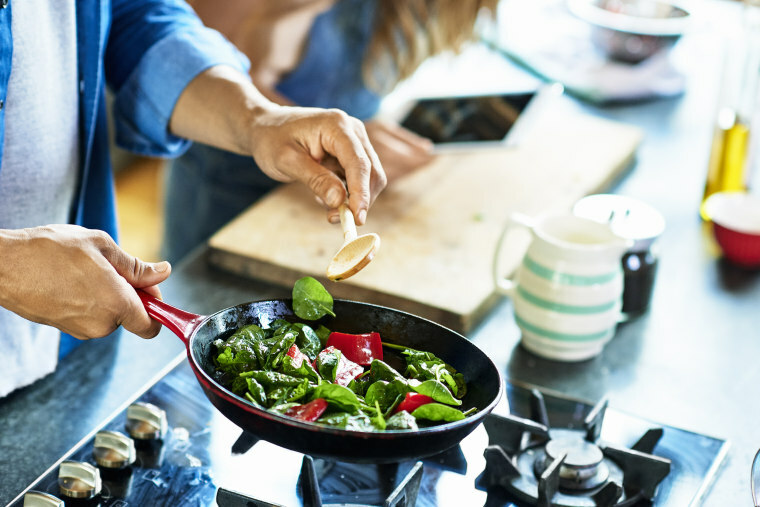 Healthy eating patterns include a variety of vegetables from all of the five vegetable subgroups — dark green, red and orange, legumes (beans and peas), starchy and other. These include all fresh, frozen, canned and dried options in cooked or raw forms, including vegetable juices. Weekly amounts from each vegetable subgroup are recommended to ensure variety and meet nutrient needs. Vegetables are important sources of many nutrients, including dietary fiber, potassium, vitamin A, vitamin C, vitamin K, copper, magnesium, vitamin E, vitamin B6, folate, iron, manganese, thiamin, niacin and choline. Each of the vegetable subgroups contributes different combinations of nutrients, making it important for individuals to consume vegetables from all the subgroups. For example, dark-green vegetables provide the most vitamin K, red and orange vegetables the most vitamin A, legumes [beans and peas] the most dietary fiber, and starchy vegetables the most potassium. Vegetables in the “other” vegetable subgroup provide a wide range of nutrients in varying amounts. Vegetable choices over time should vary and include many different vegetables. Vegetables should be consumed in a nutrient-dense form, with limited additions such as salt, butter, or creamy sauces. When selecting frozen or canned vegetables, choose those lower in sodium. So, how did I figure out how to incorporate a variety of veggies into my diet? First, I made a simple chart to help me track my intake, simply crossing off each type as I ate it. Remember, your needs will vary depending on your weight and calorie goals. Next, I identified which vegetables fit into each subgroup and how much of each is equivalent to 1 cup. ChooseMyPlate.gov, which works hand-in-hand with the Dietary Guidelines, offers a series of tables that I found very helpful. I then found veggies in each category that I enjoyed (or at least could tolerate). You don’t have to love every vegetable, but finding at least one or two in each group made eating a variety of foods less intimidating. I also tried different preparations to see what I liked. Just because I wasn’t adding butter or salt didn’t mean I had to eat everything raw. Steaming, adding herbs or roasting in a small amount of heart-healthy oil can bring out flavors. I set a goal to eat 1 cup of vegetables with lunch each day and another 1½ cups with dinner, using the chart above to track the different types. You don’t have to love every vegetable, but finding at least one or two in each group made eating a variety of foods less intimidating. I used similar charts to track various elements of my plan, from minutes of cardio each week to daily dairy and fruit intake. Remember, I was tracking all of these elements as part of my year-long Lifestyle Project, so this may seem like overkill for your needs. That said, it is well established that tracking or journaling about your food intake is an effective lifestyle-change strategy. So, figure out what you need to change in your lifestyle and then develop the tools you need to make those changes — even if that means logging every half-cup of the bell peppers you’ve hated since you were a little kid! I’m honored that NBC News BETTER invited me to share my journey with you through the completion of The Lifestyle Project and beyond, and now I want to hear from you. Do you have any tips to share? Tell me about them. Have questions about my journey? Ask me on Twitter or follow me on Instagram.